Can a trip to the state fair be a workout? 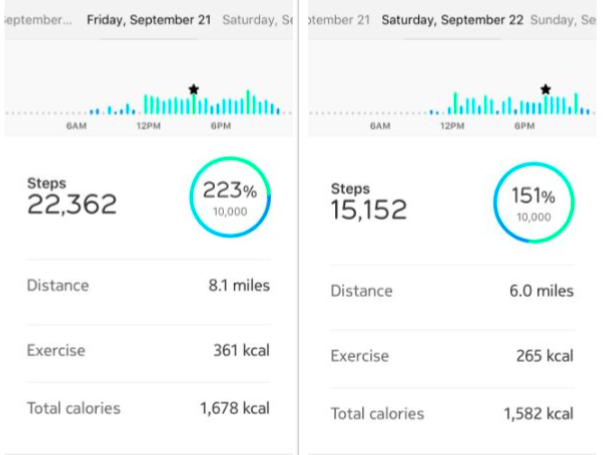 Read on as our blogger attempts to offset deep-fried martinis and cream puffs by beating her step goal. The Eastern States Exposition in Springfield, Massachusetts—known as the Big E—is something I look forward to all year. It’s enormous—the fairgrounds are 120 acres, and it’s the largest agricultural fair on the Eastern seaboard and in the top 10 largest fairs in the United States. Instead of one state, it covers all of New England: Massachusetts, Vermont, Connecticut, Maine, New Hampshire, and Rhode Island. It’s always the last two weeks of September, around my birthday, and every year, my husband and I go for two full days, because it takes us that long to see everything. I love agriculture, crafts, interesting food, cute animals, and weird signs, and the Big E has all of that and more. I always leave the Big E exhausted—it’s basically nonstop walking and eating—and given the enormous size of the fairgrounds and all the available activities, I’ve always wondered how much of a workout we actually get. This year, I decided to take my Steel HR along to find out. Come with me on my two-day journey as I eat all the things and see if I can get a metric buckton of steps. 11:38 We buy tickets and enter. I’m so excited that I can’t stop bouncing up and down. 12:06 Beer garden. I order fried Camembert cheese with champagne mustard and a hefeweiss beer. They’re not playing polka this year (bummer), so I rock out to the hair metal. 12:15 Singing animatronic vegetables in the Farm-A-Rama building. Did you know the sun is your friend? 12:21 We run into Robert de Niro, Danny DeVito and Jack Nicholson (impersonators). They seem nice. 12:29 Pierogi break. Pierogi are little Polish dumplings with various fillings. I grew up eating them (I’m Polish), and Millie’s Pierogi, from Chicopee, MA, does them perfectly. I order one potato and cheese, one sweet cheese, and one prune. Possibly you think prune dumplings sound disgusting, but trust me, you are wrong and they are delicious. I can also justify it because prunes are really good for you. 1:00 We make our way to the Avenue of States. 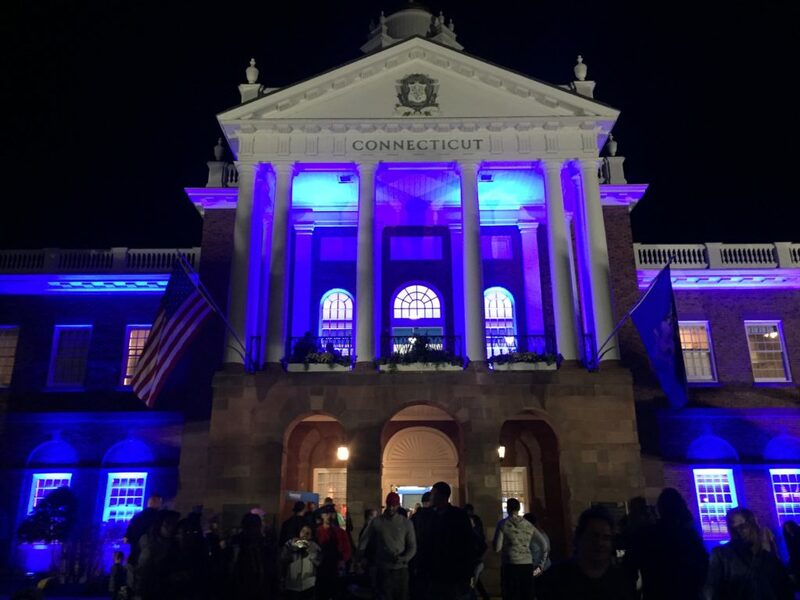 At the back of the fairgrounds are real, permanent replicas of each state house in New England—Rhode Island, Massachusetts, Connecticut, Vermont, and New Hampshire—with vendors selling food and crafts. Any New England specialty food you could ever ask for is here. Want wild blueberries? Head for Maine. Cranberries? Massachusetts. Sharp cheddar? Vermont’s your place. Never had a quahog? It’s Rhode Island for you. Just have to have some Pez? Try Connecticut. Fun fact: Pez is based in Orange, and yes, you can visit the factory. And another fun fact: the land each house sits on is technically owned by that state. So if you’re in the New Hampshire state house, you’re technically in New Hampshire. I know, I’m blowing your mind, right? 1:10 I make a beeline for Vermont to buy a lovely wool plaid bag from Johnson Woolen Mills. They’re the last woolen mill in New England—one of just five remaining mills in the U.S.—and I love their stuff. 1:21 I pounce on a fresh-baked Vermont maple cream cookie. It’s two thick shortbread cookies with about a half-inch of maple cream in the middle. It feels like 500 calories, but hey, it’s the Big E—I regret nothing! 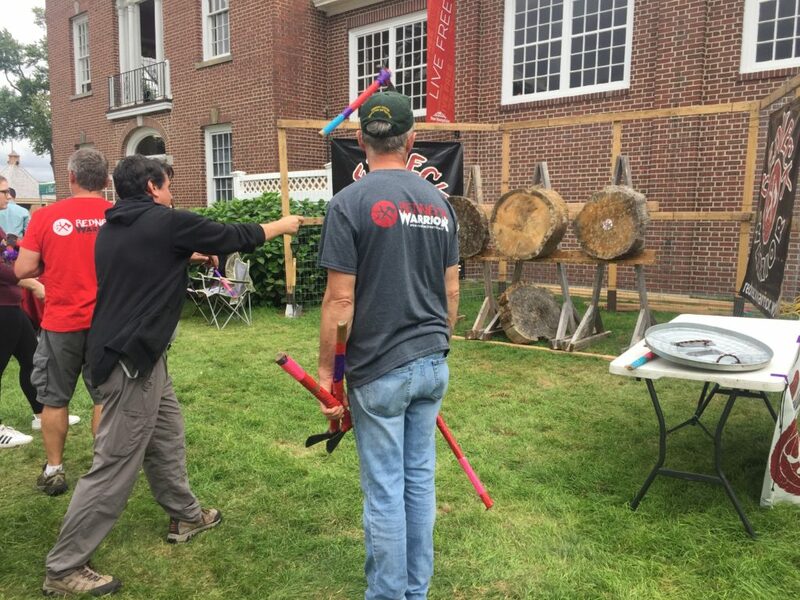 2:20 Axe-throwing outside the New Hampshire state house. How to throw an axe? The rep says, “It’s all about speed and rotation.” The axes are heavier than I thought they would be, and I over-rotate on the first 3, but axe #4 sticks the target. Feelin’ good! Then it’s my husband’s turn, and he sticks three in a row. Note to Withings: Please add “axe-throwing” as an activity? 2:45 I’m already at 6,000 steps. We walk by…camel races? Like four camels running around? Score one for Big E randomness. 3:36 Back in Vermont for a quickie wine tasting, including (of course) maple wine. Glad I’m doing this after axe-throwing. 4:35 We rock out with the Pioneer Valley Regional High School marching band. More steps! 5:11 I buy a t-shirt with George W. Bush riding a shark, guns a-blazing. It was either that or Ronald Reagan riding a T. Rex. 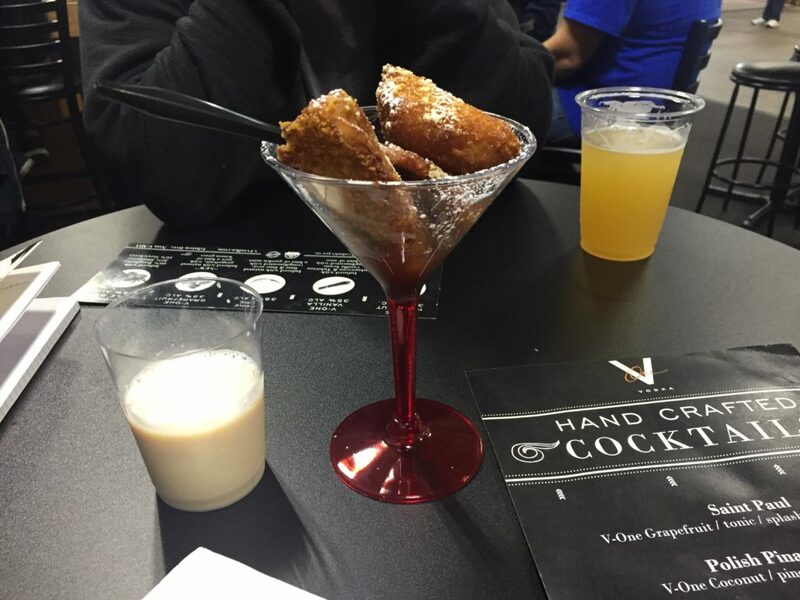 5:16 Pumpkin Nutella martini and a deep-fried martini from V One Vodka in Hadley, MA. We had the deep-fried martini a couple of years ago and it was not so good—basically deep-fried Jello shots—but they’ve really ramped it up this time, soaking apples in a mixture of cinnamon, nutmeg, chipotle and plain vodka, then rolling them in batter, deep-frying them and dousing them in more sauce. It’s like a spicy, boozy apple fritter—the best thing I’ve had at the fair so far. 5:45 We say hi to the kids (and by kids, I mean baby goats) in Farm-A-Rama. They are adorable, booming all over the place and head-butting each other. 6:20 We spy singing animatronic milk cartons in the 4-H building. I need another martini. 8:05 10,000 steps! Back to Vermont for vegetarian curry—made with chickpeas, fresh and pickled veggies and hummus over rice. Plus hibiscus tea. Vermonters really know how to do hippie vegetarian food. 9:15 Back to the other side of the fairgrounds for ride time. Let’s have some fun with Steel HR, shall we? I decide to go on the mouse coaster—a small, compact coaster with just a few drops and tight twists and turns—and see what happens with my heart rate. Note to Steel HR owners: Have you done this yet? It’s fun. To see your continuous heart rate, press and hold the button on your watch, and when you’re done, press and hold again. The graph shows up on Health Mate. My heart rate is usually in the 80s, but I hit a high on the first ascent—106! Later, Health Mate says my high was 135 for the day—I bet it was on the first drop. 10:05 I’m wiped. Time for bed. Total steps: 22,362. Health Mate congratulates me on a new all-time record. 12:06 Breakfast. We walk all the way across the fairgrounds—steps, baby, steps!—and hit up Massachusetts for pickled eggs, Finnish pancakes (very custardy; we are at the egg stand, after all) and fresh raspberries. 12:31 Second breakfast. Wild blueberry pie and iced maple coffee from, where else, Maine. I chat with the guy at the wild Maine blueberry booth. I also take a pamphlet on the health effects of wild blueberries, which turns out to be really interesting. Apparently, they can potentially reduce the risk of diabetes—something I’m super-concerned about, so yay—and cancer, and even protect against Alzheimer’s and memory decline. They also have two times the antioxidants of regular blueberries. That’s it: I’m eating blueberry pie every day from now on. 1:05 Back across the fairgrounds to visit the giant butter sculpture. 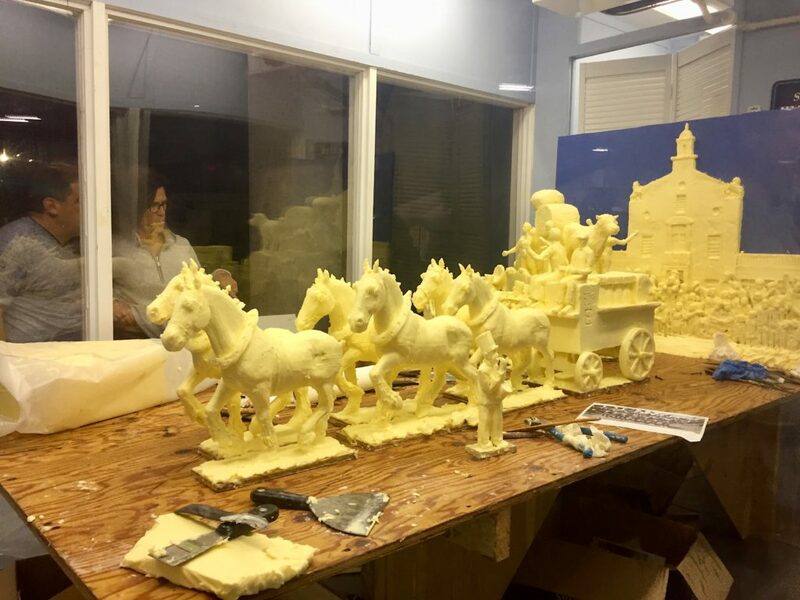 This year it’s a horse-drawn carriage made with 600 pounds of butter, enough to butter 19,200 pancakes. 2:06 Fancy horse show. I know nothing about dressage. But fun fact: Did you know that the length of a horse’s tail is a big deal in competition and some owners even get hair extensions? Now you do. 2:55 5,500 steps. Lots of people wearing Faith, Family, Firearms t-shirts. I want one that says Fungi, Frappes, Flugelhorns. 3:06 Back to the Avenue of States for corn on the cob and apple cider from New Hampshire. The corn is very different from the Indiana sweet corn I grew up with—grassier, earthier, and (sorry, Indiana) better. Oxford & Clark is performing “Take Me Home, Country Roads.” You can’t not sing along with the chorus. And yes, I totally sing along with the chorus. 3:25 It’s Vermont Day—meaning bands!—and Prydein is rocking out on bagpipes outside the building. We time our visit every year in part just to see them, because they’re great. I should really get some more steps, but I’m wiped. I flop down on the ground, eat my corn, and watch little kids crazy-dance instead. 3:55 Prydein closes with their big hit, “Stairway to Scotland,” which is exactly what it sounds like. 4:30 We head over to Farm-A-Rama to check out the giant pumpkins. This year’s winner is 1,440 pounds. Fun fact: To grow giant pumpkins, you need 10 x 15 feet of growing space…PER PLANT. 5:00 Jack Daniels whiskey bread pudding from Burgundy Brook Cafe in Palmer, MA, made with homemade cinnamon bread and doused in whipped cream. My husband grabs a fork, says, “I’ll just have a bite,” and eats half. 6:05 Spencer Trappist Vienna Lager. Spencer Brewery, at St. Joseph’s Abbey in Spencer, MA, is the first and only certified Trappist brewery in the United States. We’ve met the monks at previous Big Es and they’re really nice. They make good jam, too. This beer has serious layers—spicy, earthy, all kinds of other stuff—and I have to sit and process it for a while. 8:10 10,000 steps. Celebrate with a pierogi break. They’re out of prune, sadly, but potato and cheese are almost as good. 9:00 It’s not a Big E without a Big E cream puff. People buy boxes to take home, and there’s a reason: They’re super, super, SUPER delicious. They’re enormous, but the cream is light and fluffy and not super-sweet, so it doesn’t fill you up at all. We split one and start to wind down for the night. 9:31 Done. Turns out there was a Big E single-day attendance record on Saturday: 172,659. Not bad, right? I was really hoping to come home and inform you all that, despite all the fried food, I lost weight on this particular trip. Didn’t happen; I’m up 1.5 pounds. But the next day? I’m down 1.5. At the end of my two-day adventure at the Big E, I’ve loaded up on calories, steps, and—je ne regrette rien!